It has been an all-trail running weekend. Yesterday I ran at Stillwell Woods in the morning and returned with the family in the afternoon for a little kite flying and some low key trail runs. This morning I went to Belmont Lake, home of the Dirty Sock 10K race, for the pleasure of running its well groomed trails in the cool high 50's weather. I wanted to cover some distance today but I just couldn't face another run through the surrounding neighborhoods. 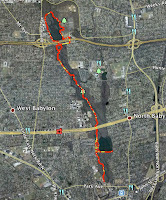 I decided to return to Babylon to run the out and back course that includes a trip around Belmont Lake and also follows the south end of a large pond. My intention was to run the Dirty Sock course but to start at the trail head instead of going 100 yards further into the woods where the race begins. I've run this course half a dozen times and I'm now familiar with many of its features. I still get a little disoriented when the trail splits but I managed to stay on course for most of my run. I wore my Kinvaras because I was curious to see how they performed on a non-paved surface. Adventure Girl ran a tough 13.1 mile trail race in her Kinvaras and spoke highly of their performance so I thought, "What the heck." Today's course is mostly dirt with gravel, sand and a small amount of paved road. I knew by the time I crossed under the Rt. 27 overpass that the Kinvaras would provide enough support for this course and I reached the lake with no issues of traction or stability. There were a lot of dog walkers, a few runners and some cyclists along my path. When I reached the lake I heard music and saw tents and booths being erected for a fair that was associated with walk-a-thon that was also going on. As I circled the lake I was tortured by the extremely loud music coming from the fair. What made it worse was that the song they were playing. "Uptown Girl" by Billy Joel, is one of my top five most hated songs, ever. I actually felt relieved when I heard the next song starting. Soon enough I was on my way south, past the lake, and back onto the path I'd followed earlier. I felt great although did I begin to tire a little around mile 4. I soon perked up and made sure I stayed on the Dirty Sock return route, especially when my path would split. Along the way I cut farther east to make sure I didn't miss the perpendicular left that takes runners along the southern end of the pond. It was here where I thought I'd gone off course because I didn't recognize the right that takes Dirty Sock racers on the path to the finish line. 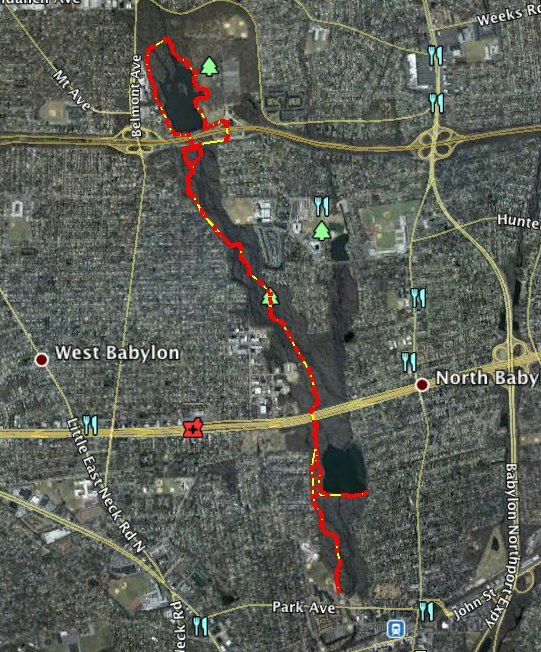 I ended up retracing my route along the pond and rejoining the original trail, finishing where I started, after covering 6.7 miles of trails. 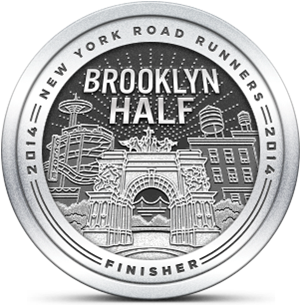 I've always enjoyed running this course although the two times that I ran the Dirty Sock race I was overwhelmed by the heat, humidity and a dearth of electrolytes. When not bombing down the path at speed for almost an hour it's a really relaxing experience. It's also a great place to run with a buddy. I'm pleased with my distance running this weekend and thrilled to have had two days of great local trail running. Now I won't feel so bad about returning to the neighborhood next week.